This is the easiest way to describe the essence of Robert Zemeckis’ new romantic WWII thriller “Allied:” it’s what “Casablanca” would have been like if Alfred Hitchcock had directed it. I’m more than thrilled that Zemeckis is back directing live action films after a decade long foray into creepy and unsatisfying motion capture animated films. But even his last two efforts “Flight” and “The Walk,” while good, felt like he was still trying to get his cinematic sea legs back. One thing I love so much about Zemeckis’ live action films (besides not disliking ANY of them, a rarity considering there are even Spielberg movies I don’t like) is that he refuses to stay in one genre. How many directors have gone from pulpy action adventure, to time travel fantasy, to animation caper, to western time travel sci-fi, to fantasy black comedy, to epic drama, to space sci-fi, to Hitchcockian supernatural thriller, to survival drama? 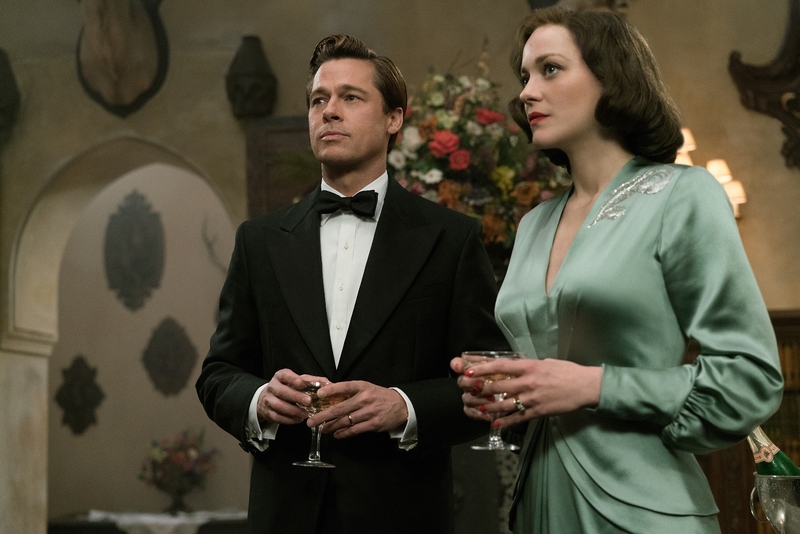 Zemeckis now puts his spin on the romantic war thrillers of the 1940s in “Allied” with glorious results. Brad Pitt and Marion Cotillard are radiant playing against each other in a film brimming with romance and suspense. The film follows a pretty standard three act structure. First we’re introduced to intelligence officer Max Vatan (Pitt) who’s going undercover in 1942 Morocco. His mission is to team up with French Resistance fighter Marianne Beausejour (Cotillard) - who he’s never met or even seen before - in Casablanca, pose as husband and wife, and assassinate the German ambassador. So these two actually fall in love, to the surprise of no one and get married living the happy life (or as happy as one can be while attempting to survive the Blitz and, you know, a world war). But then Max gets word from above that Marianne may actually be a German spy which throws a slight wrench into their happy ever after. For some reason I’ve been on a World War II kick and most of the recent films I’ve been enjoying, like 2014’s “Unbroken” have not been all that well received. The slightly old fashioned “Allied” does sort of have that “I’ve sort of seen this thing before” feel to it, but it’s obvious Zemeckis, having never worked in this genre before, was obviously trying to recreate these types of films that were popular in the 40s. The director has always been interested in technology advancements and pushing the medium forward and uses modern filmmaking techniques to tell a somewhat old-fashioned story. It’s easy to see the influences in Steven Knight’s script. But at the same time it’s also refreshing to see a big budget Hollywood movie that’s not based on any previous material or a true story. Zemeckis is truly at his best when he’s working from a script that shows equal parts originality and tribute. Trailer for Allied on TrailerAddict.